Three weeks and counting until my time off begins. At least this year I have just reached exhaustion level instead of in January! Despite the pressure of society to do more, make more, have more, I am very content to continue to take things OFF my plate. Do less, make less, have less. I am almost resentful of my work as my passions are kicking into overdrive. Just when I need a good restful break, my work is getting intense. My resistance to the alcohol is getting harder. I did a couple things yesterday to avoid buying wine. I shopped during a break at work instead of after. I bought 3 bags of chocolate candy. The candy is in the same aisle across from the wine. I turned my back on the wine. I tried to avoid the store for the last couple weeks, but finally my kid put FOOD on the grocery list. I said what kind, he said anything, we have NO FOOD! It was sadly true. I put my headphones on and listened to a podcast driving home. I ate candy for dinner and went to bed an hour after I got home. For the weekend, I need to focus on relaxing again. Getting a mental break from work if I can’t take a physical break. When I do something, I want to be sure it is not “making more”. When laundry gets to be too much, I need to donate some clothes. When I don’t have time for hobbies, I am overworked. When I am too tired to read in bed, I have waited too long to go to bed. When there are piles of “to-do’s” I am too scattered in my thoughts. Relaxation to me, means starting and finishing. Cooking & then washing & putting back the dishes. At work I group my day. I return all phone calls at one time. I do data entry for one block of time. I look at emails all at once. If something else comes up, it moves to the next block of time. Candy, clean sheets, movies, reading, cooking and seed planting is the plan for staying sober and relaxing this weekend. It’s the final push of tax season. Nothing gets finished. Tax returns are the most complicated right now, so most times you can’t finish in one sitting. There is no cleaning at home, no cooking and sooo many school obligations. My much needed weekend of rest has been cut short with a staff member’s emergency. I have to get dressed today, lol. I had some cravings to drink last night. A miscommunication and too many mandatory commitments made me upset because it will add more schedule juggling next week. I was excited to come home and watch Room. I had recently finished this haunting book and a movie night seemed perfect. My thoughts went to ‘happy to be done & would love to check out with a warm glass of red’. I talked on the (headset) phone while driving to avoid stopping at the store. I made it, but know that this could be a tough weekend of cravings to drink. My plan is to stick close to home and focus on not being busy. I really need some things to close before Monday. 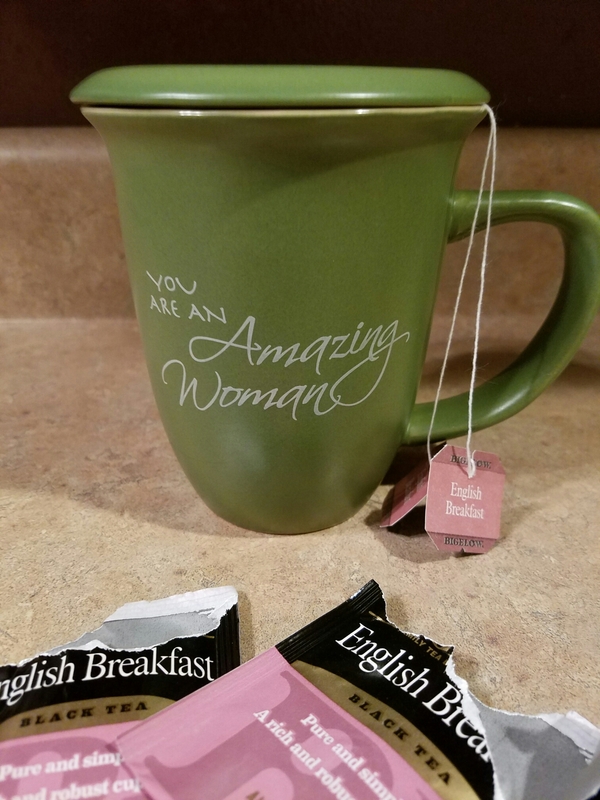 Meaning, no dirty dishes, laundry done and house picked up. Just some surface stuff, but a fresh beginning to next week. Put away some left out projects to pick up a few weeks from now. I need to cook. I need to rest. I need to read. I need to plant some seeds. The smells of warm potting soil, strawberry rhubarb bars, homemade bread, clean sheets.Time getting lost in a book until the oven timer goes off. Reading ONE chapter as a reward for vacuuming ONE room. Clean sheets. Did i say that already?! Aahh….That kind of rest. 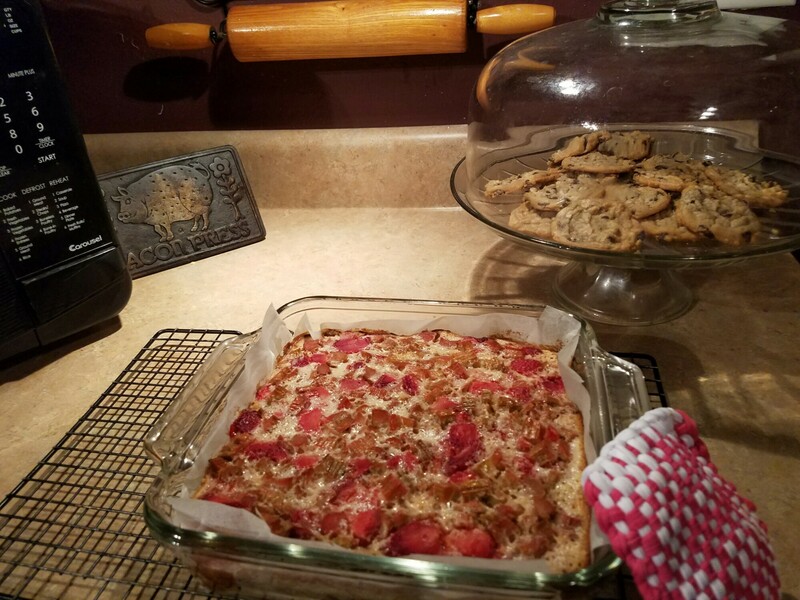 The strawberry rhubarb bars smell amazing right now…..
6 Weeks – How did This Happen? Because I have blogged for years, I get to look back. How did getting to 6 weeks sober get “easy”? Only because I did the hard work a little at a time, over many years, with lots of starts and stops. Each time built a stronger foundation. I want Mom to fix it. Someone tell me how to be sober. Just do it for me. I want Mark to stop poking me. If only everyone else would quit bugging me, needing me, if the stress would go away, I could stay sober. Mom is frustrated. She has the answer. It’s (sort of) simple. Just don’t drink today. I move. I stand further back from the problem. I take action. I can’t make Mark stop poking me, I can’t make Mom stop Mark poking me. I, however, can move. [Or I can say No & punch him.] All those answers start with me taking action. In these last six weeks being sober, I’ve taken action. I have tools built from past experiences. I’ve developed a hundred different ways to step back from my annoying brother. Taking a drink every night felt like getting poked. I couldn’t figure out how to make it stop. Being sober makes me feel powerful. I can’t stop all the stupid people in this world from trying to poke me (politics, overtime, health care, violence, global warming, no chocolate in the house). But I have learned what makes me thrive. Sometimes nibbling a lemon cookie and sipping hot tea in the evening and watching everyone else poke each other is a good place to be. Am I Attached To (Garden) Outcomes? Haha. I have been working on this issue this week. This is such a pretty way of saying I’m a control freak. What I have been trying to do is react to my gut feeling and then let it go. Let it percolate in the universe and see what comes back. A piece of land came up for sale. My heart said put a bid on it. I did! The sellers came back excruciatingly high. I took someone out to get a good opinion of the work that needed to be done and found it was much worse than I thought. My bid at half the offer price was even too high. When you have to replace both the septic and the well, that is out of my league for a piece of land for a garden. I have been trying to process my relationship with My Friend. I am very tender and hurt. I am uncovering how many ways he was quietly protecting me when I thought he wasn’t speaking to me. Unless he did x,y,z, I assumed there was no relationship. He didn’t let me go during that time. I let him go. I gave up after a week because it didn’t fit my time frame to wait. (Insert longer, detailed story here…) Looking back on my blog posts, the morning I surrendered the outcome, he showed up in my life. He walked the land I wanted to buy and asked me what was the rush? I told him I needed my garden. A garden that no one can take away from me. If I garden at my home and it sells, I lose it. If I garden at his place and we break up, I lose it. I needed to control the outcome so badly I was ready to make a $20,000 mistake. Wow. That was an eye opener. I have decided to garden (for free) at both my house and his. Just do my favorite thing. Enjoy the experience and trust the universe. Last summer my garden brought me so much joy. The minute the garden was put to bed last fall, I have been scouring catalogs and designing the next garden on graph paper. When I thought the relationship ended I thought my garden ended. I find it a little funny that out of all of this, I looked to replace my garden but didn’t want a replacement boyfriend. This is a collection of treats & rewards from several of my Day 30’s. Reading old posts reminds me how hard the first go-around at getting sober was! I was so strong to keep going. WOW This time around I haven’t much noticed. It has been relatively easy (in comparison). I was able to feel great physically very quickly. That first time was such a physical battle of PAWS or detox. Each sobriety attempt gets longer between relapses. I am also not having to develop new tools. My home is filled with those things already. This is one of those times that I am glad that I put the time and hard work in earlier, even if I failed sobriety. Now, when I truly, truly need them, my tools are there to keep me safe. I haven’t posted much about rewards and treats lately. I am definitely making them a routine part of my life. Here’s some of the special things I saved up to do on 30 days sober instead of doing just any old day. Homemade pizza – or as my son says “If I was Gordon Ramsey I would be yelling THIS IS BLOODY GREAT!” Yep, he loves my pizza. West Side Story – oh my goodness, just thinking about it makes my eyes water. The first notes of the love songs I would start to cry and my son just shook his head. In high school this was our summer musical. I was in the band and got to play 3 different clarinets for the performances. Instead of dancing or singing along, I finger my notes during the music. I have also done Fiddler on the Roof. The stories, the music, the memories. Where were you when watched musicals? I was in the orchestra pit. Every scene, every intermission, the music. Pizza dough flavor from King Arthur Flour. My package arrived yesterday with lots of goodies, such as Vietnamese cinnamon, Buttery pretzel mix, Chocolate donut mix, Very vanilla – very expensive! YUMCheesy vegetable chowder soup mix which I made for breakfast while watching movie. NEW – lol – more FranklinCovey notebooks & pages! Plus new planners for recipes and errands. Organization makes me feel safe. NEW – Toast & my homemade jelly.